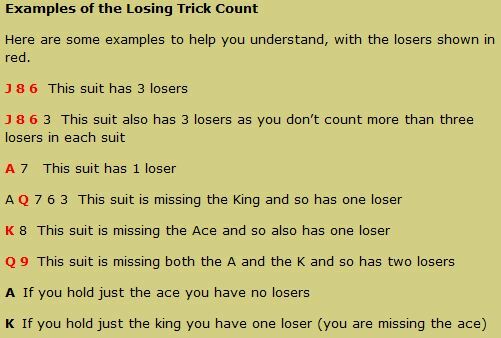 What is the Losing Trick Count? It is a more accurate way of valuing an unbalanced hand when you know you have an eight card fit. Without using this method you will probably have used shortage points when valuing a hand with a known eight card fit. To do this you count five for a void, 3 for a singleton in a suit and 1 for a doubleton suit. However, this is not the most accurate method of valuing an unabalanced hand and most bridge players use the Losing Trick Count instead. It makes it easier for you to bid your hand to the right level. Most bridge players use it – so you will be at a disadvantage if you don’t learn how to use it. You use the Losing Trick Count when you have an 8 card fit or better and an unbalanced hand. Don’t use it unless you have an 8 card fit or better. Don’t use it if you don’t yet know if you have an 8 card fit. Start by counting the losers in your own hand. Then add the losers that you believe are in your partner’s hand – you will have to make some basic assumptions about the cards your partner is holding, based on the bids they have made. Now subtract your total from 24. This gives you the number of tricks you expect to make. How do you Count Your Losers? You count one loser for each missing A, K and Q in each suit. You don’t count more losers than you have cards in the suit. So, for example, if you only hold two cards in a suit, you can’t count more than two losers.